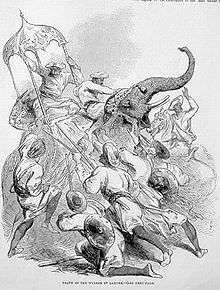 The First Anglo-Sikh War was fought between the Sikh Empire and the East India Company between 1845 and 1846. It resulted in partial subjugation of the Sikh kingdom. 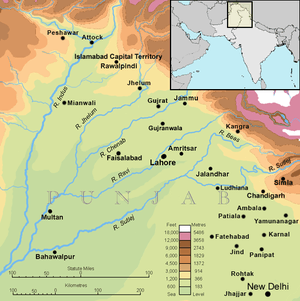 The Sikh kingdom of Punjab was expanded and consolidated by Maharajah Ranjit Singh during the early years of the nineteenth century, about the same time as the British-controlled territories were advanced by conquest or annexation to the borders of the Punjab. Ranjit Singh maintained a policy of wary friendship with the British, ceding some territory south of the Sutlej River, while at the same time building up his military forces both to deter aggression by the British and to wage war against the Afghans. He hired American and European mercenary soldiers to train his artillery, and also incorporated contingents of Hindus and Muslims into his army. Aided by disunity among the Afghans, the Sikhs conquered the cities and provinces of Peshawar and Multan from them, and also incorporated the states of Jammu and Kashmir into their empire. Once order was restored in Afghanistan, the British became obsessed with the idea that Emir Dost Mohammed Khan of Afghanistan was conspiring with Imperial Russia and launched the First Anglo-Afghan War to replace him with the compliant Shuja Shah Durrani. This move had Sikh support, in return for the formal cessation of Peshawar to the Sikhs by Shuja Shah. Initially successful, the British invasion took a disastrous turn with the Massacre of Elphinstone's Army, which lowered the prestige of the British, and the Bengal Army of the British East India Company in particular. The British finally withdrew from Afghanistan, and from Peshawar which they held as an advance base, in 1842. Ranjit Singh died in 1839. Almost immediately, his kingdom began to fall into disorder. Ranjit's unpopular legitimate son, Kharak Singh, was removed from power within a few months, and later died in prison under mysterious circumstances. It was widely believed that he was poisoned. He was replaced by his able but estranged son Kanwar Nau Nihal Singh, who also died within a few months in suspicious circumstances, after being injured by a falling archway at the Lahore Fort while returning from his father's cremation. There were at the time two major factions within the Punjab contending for power and influence: the Sikh Sindhanwalias and the Hindu Dogras. The Dogras succeeded in raising Sher Singh, the eldest illegitimate son of Ranjit Singh, to the throne in January 1841. The most prominent Sindhanwalias took refuge on British territory, but had many adherents among the Army of the Punjab. The army was expanding rapidly in the aftermath of Ranjit Singh's death, from 29,000 (with 192 guns) in 1839 to over 80,000 in 1845 as landlords and their retainers took up arms. It proclaimed itself to be the embodiment of the Sikh nation. 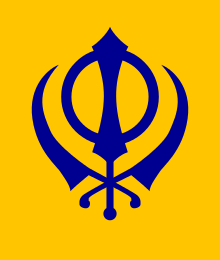 Its regimental panchayats (committees) formed an alternate power source within the kingdom, declaring that Guru Gobind Singh's ideal of the Sikh commonwealth had been revived, with the Sikhs as a whole assuming all executive, military and civil authority in the State, which British observers decried as a "dangerous military democracy". British representatives and visitors in the Punjab described the regiments as preserving "puritanical" order internally, but also as being in a perpetual state of mutiny or rebellion against the central Durbar (court). In one notorious instance of unrest, Sikh soldiers ran riot, looking for anyone who looked as if they could speak Persian (the language used by the clerks who administered the Armies's finances) and putting them to the sword. Maharajah Sher Singh was unable to meet the pay demands of the Army, although he reportedly lavished funds on a degenerate court. In September 1843 he was murdered by his cousin, an officer of the Army, Ajit Singh Sindhanwalia. The Dogras took their revenge on those responsible, and Jind Kaur, Ranjit Singh's youngest widow, became Regent for her infant son Duleep Singh. After the Vizier Hira Singh was killed, while attempting to flee the capital with loot from the Royal Treasury (Toshkana), by troops under Sham Singh Attariwala, Jind Kaur's brother Jawahar Singh became Vizier in December 1844. In 1845 he arranged the assassination of Peshaura Singh, who presented a threat to Duleep Singh. For this, he was called to account by the Army. Despite attempts to bribe the army he was butchered to death in September 1845 in the presence of Jind Kaur and Duleep Singh. Jind Kaur publicly vowed revenge against her brother's murderers, she remained Regent. Lal Singh became Vizier, and Tej Singh became commander of the army. Sikh historians have stressed that both these men were prominent in the Dogra faction. Originally high-caste Hindus from outside the Punjab, both had converted to Sikhism in 1818. Immediately after the death of Ranjit Singh, the British East India Company had begun increasing its military strength, particularly in the regions adjacent to the Punjab, establishing a military cantonment at Ferozepur, only a few miles from the Sutlej River which marked the frontier between British-ruled India and the Punjab. In 1843, they conquered and annexed Sindh, to the south of the Punjab, in a move which many British people regarded as cynical and ignoble. This did not gain the British any respect in the Punjab, and increased suspicions of British motives. The actions and attitudes of the British, under Governors-General Lord Ellenborough and his successor, Sir Henry Hardinge, are disputed. By most British accounts, their main concern was that the Sikh Army, without strong leadership to restrain them, was a serious threat to British territories along the border. Sikh and Indian historians have countered that the military preparations made by these Governors-General were offensive in nature; for example, they prepared bridging trains and siege gun batteries, which would be unlikely to be required in a purely defensive operation. The British attitudes were affected by reports from their new Political Agent in the frontier districts, Major George Broadfoot, who stressed the disorder in the Punjab and recounted every tale of corrupt behaviour at the court. For some British officials, there was a strong desire to expand British influence and control into the Punjab, as it was the only remaining formidable force that could threaten the British hold in India and the last remaining independent kingdom not under British influence. The kingdom was also renowned for being the wealthiest, the Koh-i-Noor being but one of its many treasures. Despite this, it is unlikely that the British East India Company would have deliberately attempted to annex the Punjab had the war not occurred, as they simply did not have the manpower or resources to keep a hold on the territories (as proven by the outbreak of the Second Anglo-Sikh War). Nevertheless, the unconcealed and seemingly aggressive British military build-up at the borders had the effect of increasing tension within the Punjab and the Sikh Army. After mutual demands and accusations between the Sikh Durbar and the East India Company, diplomatic relations were broken. An East India Company army began marching towards Ferozepur, where a division was already stationed. This army was commanded by Sir Hugh Gough, the Commander in Chief of the Bengal Army, and was accompanied by Sir Henry Hardinge, the British Governor General of Bengal, who placed himself beneath Gough in the military chain of command. The British East India Company forces consisted of formations of the Bengal Army, with usually one British unit to every three or four Bengal infantry or cavalry units. Most of the artillery on the British side consisted of light guns from the elite Bengal Horse Artillery. The Sikh Army at that time was led by General Raja Lal Singh who, with Tej Singh, betrayed the Sikhs during the course of the war. Lal Singh was regularly supplying information and even receiving instructions from British officers. In response to the British move, the Sikh army began crossing the Sutlej on 11 December 1845. Although the leaders and principal units of the army were Sikhs, there were also Punjabi, Pakhtun and Kashmiri infantry units. 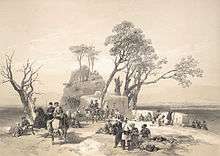 The artillery consisted mainly of units of heavy guns, which had been organised and trained by European mercenaries. The Sikhs claimed they were only moving into Sikh possessions (specifically the village of Moran, whose ownership was disputed) on the east side of the river, but the move was regarded by the British as clearly hostile and they declared war. One Sikh army under Tej Singh advanced towards Ferozepur but made no effort to surround or attack the exposed British division there. Another force under Lal Singh clashed with Gough's and Hardinge's advancing forces at the Battle of Mudki on 18 December. The British won an untidy encounter battle. On the next day, the British came in sight of the large Sikh entrenchment at Ferozeshah. Gough wished to attack at once, but Hardinge used his position as Governor General to overrule him and order him to wait for the division from Ferozepur to arrive. When they appeared late on 21 December, Gough attacked in the few hours of daylight left. The well-served Sikh artillery caused heavy casualties among the British, and their infantry fought desperately. On the other hand, the elite of the Sikh army, the irregular cavalry or ghodachadas (alt. 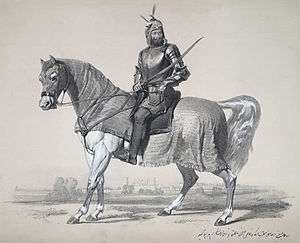 gorracharra, horse-mounted), were comparatively ineffective against Gough's infantry and cavalry as they had been kept from the battlefield by Lal Singh. By nightfall, some of Gough's army had fought their way into the Sikh positions, but other units had been driven back in disorder. Hardinge expected a defeat on the following day and ordered the state papers at Mudki to be burned in this event. However, on the following morning, the British and Bengal Army units rallied and drove the Sikhs from the rest of their fortifications. Lal Singh had made no effort to rally or reorganise his army. At this point, Tej Singh's army appeared. Once again, Gough's exhausted army faced defeat and disaster, but Tej Singh inexplicably withdrew, claiming that British cavalry and artillery which were withdrawing to replenish ammunition were actually making an outflanking move. Operations temporarily halted, mainly because Gough's army was exhausted and required rest and reinforcements. The Sikhs were temporarily dismayed by their defeats and by their commanders' actions, but rallied when fresh units and leaders joined them, and Maharani Jind Kaur exhorted 500 selected officers to make renewed efforts. When hostilities resumed, a Sikh detachment crossed the Sutlej near Aliwal, threatening Gough's lines of supply and communications. A division under Sir Harry Smith was sent to deal with them. Sikh cavalry attacked Smith continually on his march and captured his baggage, but Smith received reinforcements and at the Battle of Aliwal on 28 January 1846, he won a model victory, eliminating the Sikh bridgehead. Gough's main army had now been reinforced, and rejoined by Smith's division, they attacked the main Sikh bridgehead at Sobraon on 10 February. Tej Singh is said to have deserted the Sikh army early in the battle. Although the Sikh army resisted as stubbornly as at Ferozeshah, Gough's troops eventually broke into their position. The bridges behind the Sikhs broke under British artillery fire, or were ordered to be destroyed behind him by Tej Singh. The Sikh army was trapped. None of them surrendered, and the British troops showed little mercy. This defeat effectively broke the Sikh army. In the Treaty of Lahore on 9 March 1846, the Sikhs were made to surrender the valuable region (the Jullundur Doab) between the Beas River and Sutlej River. The Lahore Durbar was also required to pay an indemnity of 15 million rupees. Because it could not readily raise this sum, it ceded Kashmir, Hazarah and all the forts, territories, rights and interests in the hill countries situated between the Rivers Beas and Indus to the East India Company, as equivalent to ten million of rupees. In a later separate arrangement (the Treaty of Amritsar), the Raja of Jammu, Gulab Singh, purchased Kashmir from the East India Company for a payment of 7.5 million rupees and was granted the title Maharaja of Jammu and Kashmir. Maharaja Duleep Singh remained ruler of the Punjab and at first his mother, Maharani Jindan Kaur, remained as Regent. However, the Durbar later requested that the British presence remain until the Maharaja attained the age of 16. The British consented to this and on 16 December 1846, the Treaty of Bhyroval provided for the Maharani to be awarded a pension of 150,000 rupees and be replaced by a British resident in Lahore supported by a Council of Regency, with agents in other cities and regions. This effectively gave the East India Company control of the government. Sikh historians have always maintained that, in order to retain their hold on power and maintain the figurehead rule of Duleep Singh, Lal Singh and Tej Singh embarked on the war with the deliberate intent of breaking their own army. In particular, Lal Singh was corresponding with a British political officer and betraying state and military secrets throughout the war. Lal Singh's and Tej Singh's desertion of their armies and refusal to attack when opportunity offered seem inexplicable otherwise. The Sikh empire was until then one of the few remaining kingdoms in India after the rise of the company and the fall of the Mughal empire. 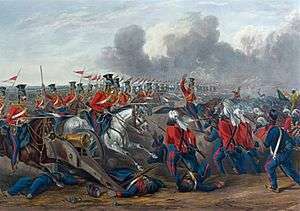 Although the Sikh Army was weakened by the war, resentment at British interference in the government led to the Second Anglo-Sikh War within three years. Farwell, Byron (1973). Queen Victoria's little wars. Wordsworth Editions. ISBN 1-84022-216-6. Featherstone, Donald (2007). At Them with the Bayonet: The First Anglo-Sikh War 1845-1846. Leonnaur Books. Hernon, Ian (2003). Britain's forgotten wars. Sutton Publishing Ltd. ISBN 0-7509-3162-0. A highly fictionalised (lasicivious, titillating and scurrilous) description of the origins and course of the First Anglo-Sikh War (as well as various Sikh fortifications including breastworks) can be found in the comedy/adventure novel Flashman and the Mountain of Light by George MacDonald Fraser (1990). However, the book's well-researched footnotes are a source for serious historical information and further reading, such as the memoirs of some of the principals involved. ↑ Allen, Charles (2001). Soldier Sahibs. Abacus. p. 28. ISBN 0-349-11456-0. ↑ Joseph, Cunningham (1853). Cunningham's history of the Sikhs. p. 257. Retrieved 24 July 2015. ↑ Sidhu, Amarpal (2013). The First Anglo-Sikh War. Stroud, Gloucs: Amberley Publishing Limited. ISBN 978-1-84868-983-1. 1 2 Jawandha, Nahar (2010). Glimpses of Sikhism. New Delhi: Sanbun Publishers. p. 64. ISBN 978-93-80213-25-5. ↑ Terms of the Treaty of Amritsar Archived 5 January 2009 at the Wayback Machine. Wikimedia Commons has media related to First Anglo-Sikh War.